Nghe An (Nghệ An) province has the largest area of Vietnam (Việt Nam), often referred by the famous landmark Cua Lo (Cửa Lò) because for a long time, the east of Nghe An has been exploited and developed into an economic – political – cultural center of the province thanks to the advantage of the province near the seaside and Highway 1. On the other hand, the western area of the province is completely different, with the wilderness, pristine. Only when the Ho Chi Minh (Hồ Chí Minh) trail was built, this area was taken from their box, and started to get in tune with the modern life. And thus, an interesting site gradually being known to everyone is 7-storey waterfall in the mountainous Que Phong (Quế Phong) district. Despite not being in the form of “blockbusters” as Son Doong cave in Quang Binh (Quảng Bình), 7-storey waterfall on the Huoi Dan(Huổi Đán) stream also flutters Vietnamese backpackers. With the rugged terrain, without path so before Ho Chi Minh trail appeared, no one ventured to this area. This factor makes Que Phong possess a rich biosphere reserve in Vietnam (Việt Nam), named Pu Hoat (Pù Hoạt). 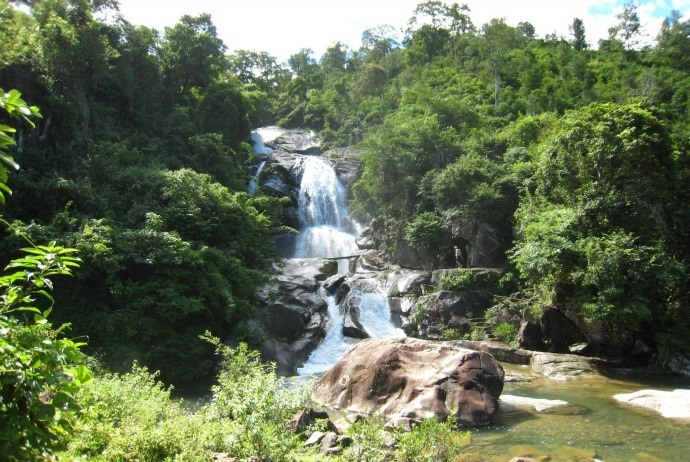 This 7-storey waterfall is located in the core of Pu Hoat forest, on the Huoi Dan from Laos. Due to the discreet place, 7-storey looks like a lovely princess trapped in a castle in the forest and nobody knows. 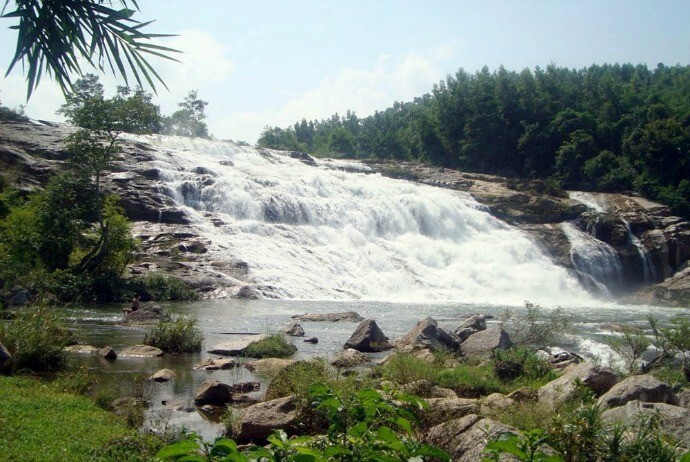 If you research the information about this fall in the forums or social networking sites about tourism, there is not much, but it just mentions Sao Va waterfall in Que Phong. Sao Va is famous but its loveliness and majesty is far from the 7-storey waterfall. 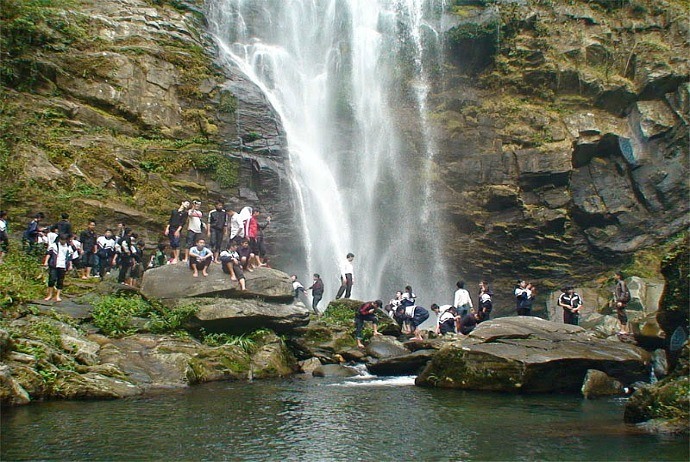 7-storey waterfall is not a single waterfall but is a complex like Ban Gioc (Bản Giốc) but with more monumental scale. 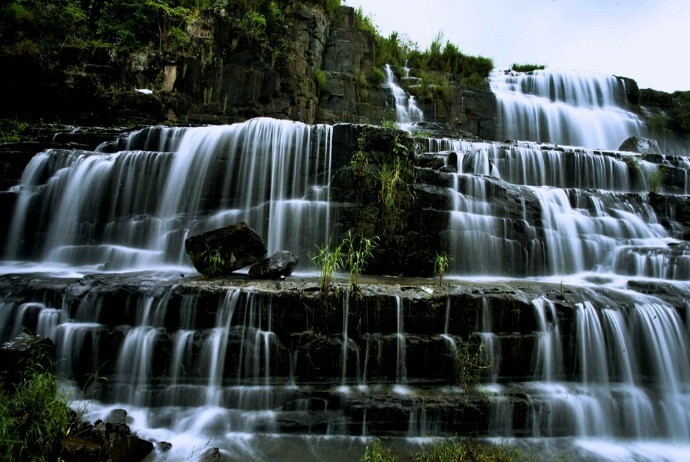 7-storey waterfall stretches over a distance of 7km, divided into 7 main aquifers and thousands of different small falls. From the ancient time, this region also witnesses the geological formations so the terrain is craggy and majestic with unique cuts and fractures. Moreover, due to the weathering and hydration process of thousands of years, the area was polished creating unique shapes. The rocks and water in this waterfall stirs each other, forming a unique wonder which is as ecstatic as sightseeing. 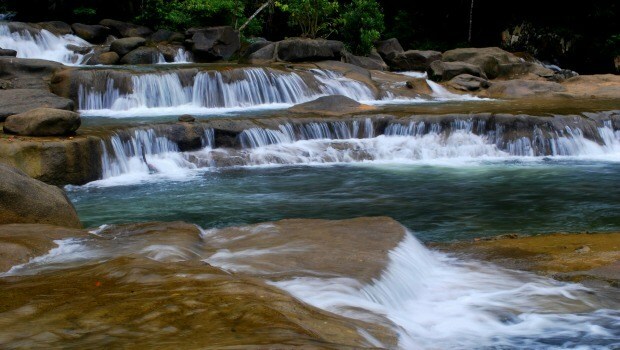 The surface of the rocks in waterfall was polished smoothly so if you love adventure, then take a step to the top, go to the middle of the stream lines, sit down, and stretch your feet to experience the thrilling but interesting feeling of the fall riding game. Take heart, at the end of the ride, there is an extremely safe shock absorber along with the protecting ropes and local people standing to support at any time. Other than the “sacred forest toxic water”, the 7-storey waterfall is not toxic at all, but an abundant source supplying water for local people. They consider Huoi Dan stream as a gift of the god so they strive to protect the stream from being abused by pollution and harmful things. Majesty and gracefulness are what tourists experience when visiting 7-storey waterfall. But, the pristine feature here creates its compelling and inviting beauty. If you have a chance to visit the western area of Nghe An (Nghệ An), come to admire Pu Hoat to witness the 7-storey waterfall, to drink the cool water of Huoi Dan stream, to be settled down in the landscape picture painted white silk flying in the middle of the jungle, in the middle of glutinous rice terrace – all aim to bath the soul in the pristine beauty from the ancient time. From March to September, this is a beautiful time to explore the 7 storey fall. From Hanoi, go along Ho Chi Minh way to Thai Hoa (Thái Hoà) town ( Nghia Dan (Nghĩa Đàn) district, Nghe An), then turn on highway 48 to get to Que Phong. When arriving T-junction Phu Phuong (Phú Phương), turn to Hanh Dich (Hạnh Dịch) commune, and go about 10km to the ancient Muong Dan village of Thai (Thái) ethnic. From here, you start walk into Pu Hoat forest, along Huoi Dan stream to reach 7-storey waterfall. Despite being new, service here is quite good. Tourists could eat some local specialties like rice, hill chicken, stream fish,… which are cheap and delicious. The drinks such as mineral water, beer, and soft drinks are various. Before going out the waterfall, you just need to book the restaurant in advance. There is “homestay” service in Muong Dan (Mường Đán) and Huo Muong (Huở Mương) mountain villages. Otherwise, you could come back to the center of Que Phong district to relax in the hotels or motels. In addition to admire the beauty of the waterfall and trekking upstream, visitors can have fun with friends through rowing, sliding cascade, showering waterfall activities. The cost of raft rent is 20,000 VND / hour. Sliding and swimming are free. Apart from 7-storey waterfall, when visiting here, tourists also combine to explore the biosphere reserve and primary forest Pu Hoat, visit Sao Va waterfall near the Laos border, and visit the Hua Na (Hủa Na) hydropower with unique tea islands. Because tourism infrastructure here is still sparse no so visitors can make reservations, contact accommodation places through internet. However, you can inquire the information through Mr. Du, the manager having service on the shore of the waterfall. (Tel: +84 166 700 9848). It should be noted that this is the border and nature country reserve area, travelers should carry identification documents such as identity cards, passports and comply with regulations.